This page has 3 C programs to check odd or even. First program to check odd or even using switch . . . case statement, the second program is to check odd or even using function and other by using if statement. Even number is an Integer number. Even number can be divided by 2. The remainder after dividing an even number by 2 is zero. The Even numbers examples are 0,2,4,6,8, . . . Odd number is an Integer number. Odd number can not be divided by 2. The Odd number examples are 1,3,5,7,9,11,13, . . . The remainder after dividing an Odd number by 2 is one. The below given C programs are used to check whether a number is Odd or Even. Kindly check out the Odd or Even program. The odd or even program can be asked in different ways for school and college going students. The odd or even program question may be asked as (1). C Program to check Whether a Number is Even or Odd. (2). C program for checking odd or even number (3). C program to check a Number is odd or even (4). C Program to check whether the given Number is Even or Odd (5). C Program to check if number is even or odd (6). C Program to check if number is odd or even number (7). C Program to check Odd or Even numbers (8). C Program to check number is Even or Odd (9). Program to find whether the given number is odd or even (10). Program to find a given number is even or odd (11). Program to find a number is odd or even (12). Program to find odd or even (13). Program to check odd or even. 3725 is an odd number. -26 is an even number. 17 is an odd number. 26 is an even number. * C program to check whether a number is odd or even. I am a Professor and Head of Department of Computer Science in an Arts and Science College. 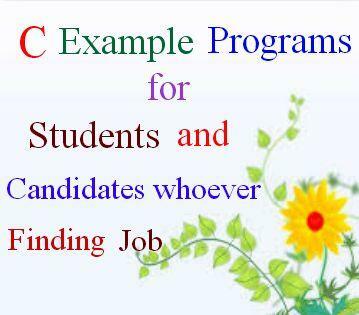 I have designed this website to provide solved example programs of different categories for all the school and college going students to learn C language deeply, and to practice Interview based Multiple Choice (Objective Type) questions and answers. The Even or Odd program in C is used to test the given number and to specify whether the number belongs to Even or Odd. It is clear that the remainder after the division of Even number by 2 will be Zero, and the remainder after the division of Odd number by 2 will be one. The Even and Odd numbers are generally belongs to Integer. The Even and Odd numbers may have no decimal point.